Using planters with a small opening or neck limits air circulation and makes watering difficult. A shallow planter will dry out very quickly. Never use use a planter without drainage holes. 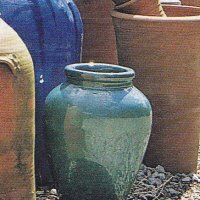 Never use a container that previously held chemicals or caustic materials for a planter. Never use a biodegradable container as a planter. Things could get interesting half way through the season.